Have a debt to settle? For the Romans, March was a notable time to settle debts (according to Wikipedia). Maybe there's a reason we're in the thick of tax season: maybe spring is just a natural time of the year for thinking through what you owe--or what you're due. If you're in the thick of taxes, may they go smoothly before we all enter the dreaded Mercury in retrograde season later this month. As for me, to be perfectly honest, I'm not a big March fan. It was hard when I lived in Chicago because everything--the ground, the trees, the houses--looked gray. In San Francisco, it's a beautiful time of the year, but it's also my peak allergy season. Lately, it has me pleading with the flowering trees on our street to show some mercy. Besides, March can come with trouble: the Smithsonian has a list of all the bad things that have happened on March 15. Beware the Ides of March, indeed. But down to business: this has been an incredibly busy time of the year for cookbook news. First, the IACP book awards were announced at the end of February. I was at the awards ceremony and accepted the award for Champagne, a book I worked on, because the author, Peter Liem, couldn't make it. This year, though, the IACP awards devolved into a Julius Caesar style drama. The original book of the year, Six Seasons, is no longer the book of the year because the co-author of the book is IACP's CEO. When Six Seasons won, it prompted many to question the IACP’s entire system for judging cookbooks. A lot has already been written about the awards, but to recap: IACP created new regulations to ensure that they won't find themselves accused of nepotism in the future. Marisa and Joy from the podcast Local Mouthful had a smart conversation about the IACP awards--and cookbook awards in general--in the beginning of this episode. Give it a listen for more context. My two cents? Awards will continue to be imperfect ways of evaluating titles. But people love awards, and they do force us to think about the merit of certain books and subjects. If I had to choose between receiving an award and having a book reach a best-sellers list, though? I'd pick the latter. No question. The James Beard Award Finalists have been announced, too--both chefs and media awards. There has long been rumors of JBA nepotism in cookbooks (Years ago, I had a chat with one of the cookbook award judges who threw up her hands at the books that won in the category she was judging- she thought it was a deeply flawed book and should have never made it to the final round) But the JBA awards, no matter how important they are for cookbook writers, are even more important for chefs and restaurants. And this year, these awards are going to have some awkward #metoo movements. How will it all turn out? We'll see when the awards are announced (April 27 for cookbooks and May 7 for restaurants and chefs). 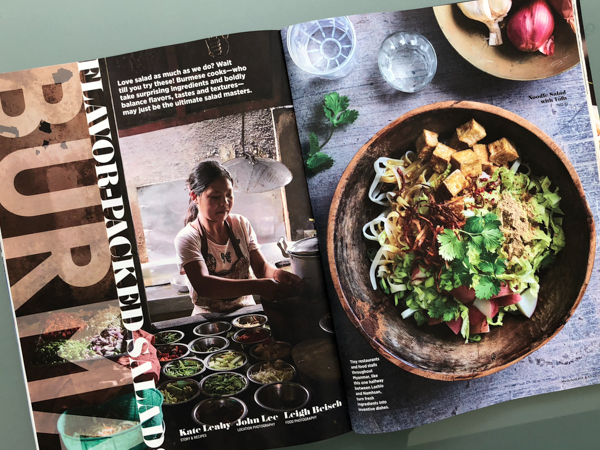 In non-book, shameless-plug news: I can't tell you how happy I was to see my first article I wrote for Eating Well magazine made the cover (see photo above). I started talking about the article with food editor Jim Romanoff at least a year ago, finally landing the assignment this past fall. The piece is about Burmese salads, and it ran in the annual travel issue alongside great pieces by J.J. Goode (who wrote about the variety of chicken options off of the 7 train that goes through Queens) and Betsy Andrews (who hung out with cooks, farmers, and bakers in Italy's Piedmont region). Some of the photography for my story was shot in Myanmar by John Lee (my co-author on the Lavash book), while the studio work was done in SF with Leigh Beisch. Here's one of my favorite salads from the story. Myanmar is not an easy place to write about these days, and I was grateful that the magazine offered us a chance to share a different side of the country that had nothing to do with politics. And that's a wrap. But since I'm posting this on St. Patty's Day, and my last name is 100% Irish, I'll leave you with my favorite Irish soda bread. It's also one of the easiest things to make--all you need to make it are a handful of ingredients, a bowl, a pan, a preheated oven, and your hands. This was the batch I baked this morning.